While hanging out in Hong Kong, Adam (England) and I took a weekend trip to Macau, where we encountered some interesting food options on the menu. Congee is a rice-based soup or porridge, and clearly the locals don't like to get it without some body parts thrown in. On another day in Macau, I tried turtle casserole for the first (and last) time. 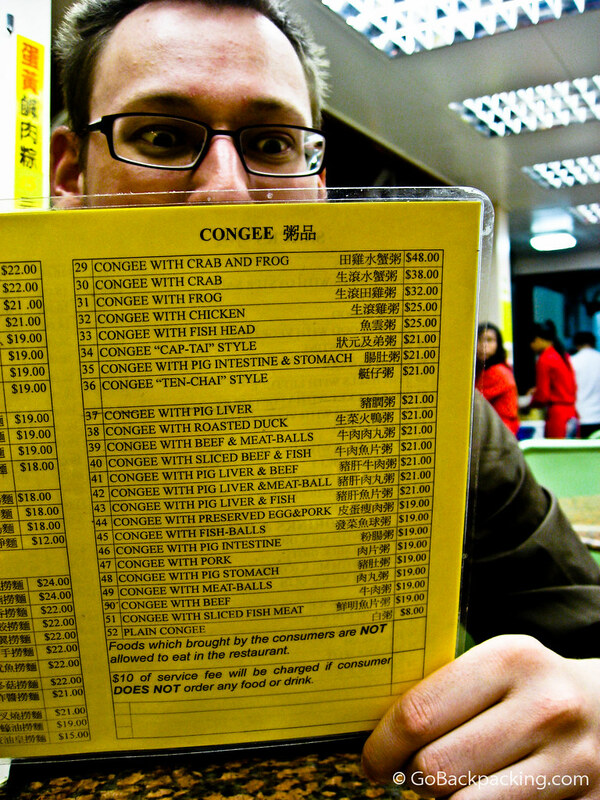 Do you prefer your congee with pig intestines, or liver? Would you like some congee with your congee. Yikes! I think I had fried rice for lunch! Sometimes I’m adventurous…sometimes not so much. Are those prices in $USD? Seem quite expensive, but I’ve never had congee so tell me if that’s a fair price. No, that’s not USD — it’s probably the Hong Kong dollar, I can’t recall if Macau uses different currency. In USD, it was probably a few bucks.